Touch the ignition switch with the Intelligent Key as illustrated. (A chime will sound.) 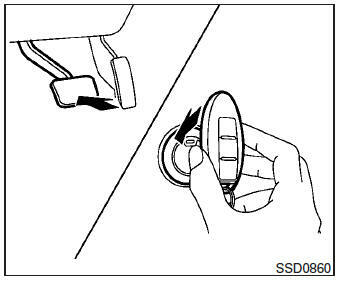 After step 3 is performed, when the ignition switch is pushed without depressing the brake pedal, the ignition switch position will change to ACC. Push the ignition switch while depressing the brake pedal within 10 seconds after the chime sounds. The engine will start. When the ignition switch is pushed to the ACC or ON position or the engine is started by the above procedure, the Intelligent Key battery discharge indicator appears in the vehicle information display even when the Intelligent Key is inside the vehicle. This is not a malfunction. To turn off the Intelligent Key battery discharge indicator, touch the ignition switch with the Intelligent Key again. If the Intelligent Key battery discharge indicator appears, replace the battery as soon as possible. See “Battery Replacement” in the “Maintenance and do-it-yourself” section.